I resolve in the new year to review more pear ciders. 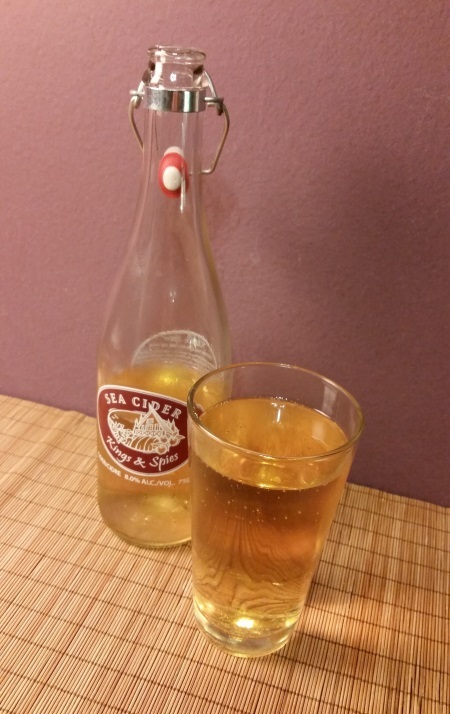 Apple cider is all well and good, but I’ve gotta confess I have an extra-soft spot for pear cider. Finnriver’s is a light gold, very very slightly cloudy, and has a barely-there aroma of mostly apples, with just an edge of cool crisp pear. 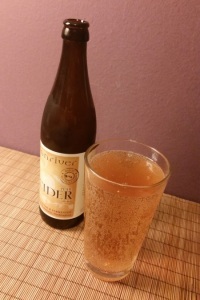 There’s a fresh, real-fruit aspect to the flavor — I saw tasting notes on Finnriver’s site when I was looking up the cider (to see if they mentioned whether pear juice was part of the fermentation or added in afterward to back-sweeten), and though I wouldn’t go so far as the reviewer in saying Finnriver’s pear cider tastes more like a skin-on pear than a peeled pear, I can see what he’s getting at. There’s a certain bitterness grounding the pear flavor, pulling it out of the realm of single-note sweetness. You can order some Finnriver cider for yourself here, or look for their stuff in your local stores. One of these days I’m definitely going to make it out to their farm for a visit. Posted in Cider. Tagged 500mL, finnriver cider, pear cider. Normally I take the photo before I take a sip, but this smelled so unique curiosity got the better of me. So, Bad Riders, how do you feel about chocolate oranges? Depending on how you answer, you’re likely either going to love or hate Whistler Brewing Co.’s Winter Dunkel. When I say chocolate oranges, I don’t mean any old orange and chocolate combo here. I’m thinking specifically of those foil-covered, milk chocolate, “whack and unwrap” balls that tend to appear in the candy aisle as the holidays get nearer. If you’re in any way unenthusiastic about a beer version of that candy, Dunkel is probably not the brew for you. On the nose, the beer is all fresh orange zest and milk chocolate, and there’s plenty of the same on the tongue. I say milk chocolate for a reason. The flavour’s on the sweet and creamy side, withs none of the bitterness or deeper cocoa notes you might expect with a darker chocolate. There is, however, a little bit more going on with this beer than pure candy. Thanks to the addition of coriander, this sweet-to-start beer actually has a finish that walks the line between savoury and spicy. Typing that out, I feel like it shouldn’t work. But it’s somehow right, in the same way that Mexican hot chocolate benefits from an infusion of chili pepper. Without the coriander I suspect Winter Dunkel would be a little too sweet, verging on artificial. But, with the movement from candy to spice in each sip the beer stays interesting far longer, to the point where I was disappointed when my testing bomber ran out. 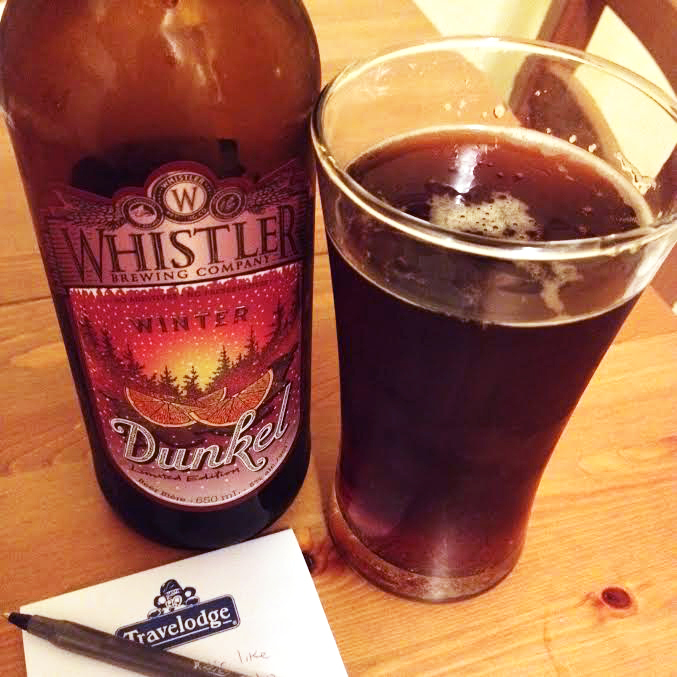 Another surprise — compared to Whistler’s other annual cold-weather offering, Chestnut Ale, the Winter Dunkel isn’t nearly as sweet or as heavy as I was expecting. That’s a relief. Dunkel has enough going on without piling on the richness. Posted in Beer. Tagged Whistler, Whistler Brewing Co., winter beer. Whence your horned apple logo, Bull Run? I know eventually I will have tried every cider my favorite local liquor store has to offer, but so far I still manage to walk in and find entire brands I’ve either not yet reviewed or not reviewed in many weeks. Bull Run is one of the former — I thought for sure I’d reviewed something of theirs before, but no, they’re a newcomer to the annals of Bad Rider Reviews. Unassuming at first glance, the Gravenstein Single Varietal is definitely distinctive. The aroma is funky under the sweet apple smell, a little cheese drifting in from somewhere. It’s tart, somewhat acidic, and lives up to the bottle label of “medium dry” — only sweet enough to keep it from being dry. It’s light, but there’s something stony about it as well, like an undertaste of cold granite. It would be interesting to get my hands on an example of the apple itself when I try these single varietal ciders. I can’t say I recognize the taste of a Gravenstein compared to another type of apple, though as I mentioned, I can at least tell this cider is different. This cider makes me wish I were the kind of person who could put together a cheese and charcuterie board from the contents of their pantry at the drop of a hat. It would pair fabulously with some complex cheeses and cured meats. 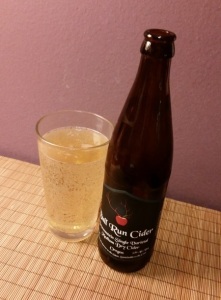 Check Bull Run’s website if you’d like to find some of their cider for yourself, though it only lists places in Portland so don’t count on it to be entirely comprehensive. Posted in Cider. Tagged 500mL, bull run, gravenstein single varietal. I’ll admit it, this is another bottle I bought at least 50 per cent for the label. If there was any kind of storyline to Bad Rider’s beer section in 2014 (other than the bit where an election somehow made me too busy too drink) it was the slow erosion of my ‘I’m not into hoppy beers’ claims. While I’m still not one to reach for an IPA, with Maiden Voyage I think I have to admit I enjoy hops. And for this beer, you’d have to. 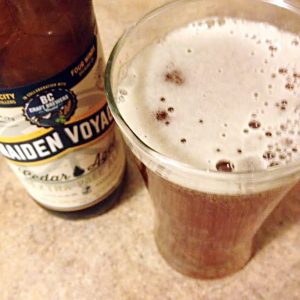 Maiden Voyage starts off with hops, then hits you with a bitterness that lingers. And lingers. While the hops are sharp and bright to start, it’s the bitterness that stuck with me most through drinking this. I suspect this makes it “challenging,” or at least, that’s how I’d describe it to the many avowed hop-haters I talk beer with on a regular basis. But I’ve gone through a couple bottles of this now and for some reason I can’t stop going back to the well. It might be the woodsy notes — to me it’s got a taste reminiscent of pine, though everyone else I know who’s tasted it says that’s because I apparently don’t know what cedar (which the beer was aged in) tastes like. The spiciness of the wood rounds out the beer’s other flavours, though since it’s not exactly subtle I wouldn’t be surprised if it’s just as challenging for some drinkers as the rest of what’s going on with Maiden Voyage. It’s also got good carbonation, and after a month of mainly porters, stouts and winter ales with the heft of molasses it’s nice to drink something a little lighter for a change that nonetheless feels like a cold-weather beer. The story of Maiden Voyage itself is pretty cool: according to the Georgia Straight, the B.C. Craft Brewers Guild paired up a larger craft brewer (Central City) with smaller Four Winds Brewing Co. to produce a beer that would have been out of reach for the smaller partner. It wasn’t immediately clear for the guild’s website if this kind of teamwork is going to become a regular occurrence, but count me in for future iterations, should that be the case. Posted in Beer. Tagged BC Craft Brewers Guild, Central City Brewing, Four Winds Brewing. Looks like a little, felt like a lot. 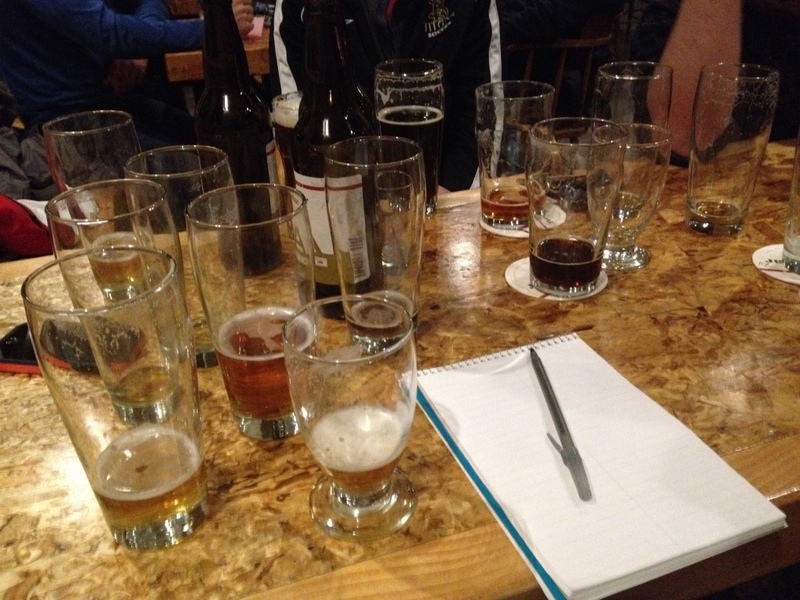 There came a moment as I was scribbling notes about this beer, when I realized I’d forgotten to snap a photo. Grabbing my half-empty solo cup and bottle, I attempted to set up the two in a way that would allow for our the beer section’s sort of shot. No dice. I’d drunk to deep of the festive brew. And while there was enough ale left in the bottle to fill up the cup to appropriate levels… well. If I pour it, I have to drink it, I thought, and snapped the pic as was. All Howe Sounds brews are, due to their 1L packaging, a whole lot of beer. But Father John’s Winter Ale would be a whole lot of brew even if served in a shot glass. If gingerbread cake batter and beer had a torrid affair, I imagine their offspring would have a similar weight and density. This is a beer that feels thick on the tongue and heavy in the stomach. A cup of it has a richness that might sustain you through several months of winter hibernation. The flavour profile — ginger and nutmeg, brown sugar, honey and malt — doesn’t exactly lighten the load. It’s quite sweet and while there’s lots of ginger here it doesn’t add brightness. I felt like the ale could have used something else to break up the taste. 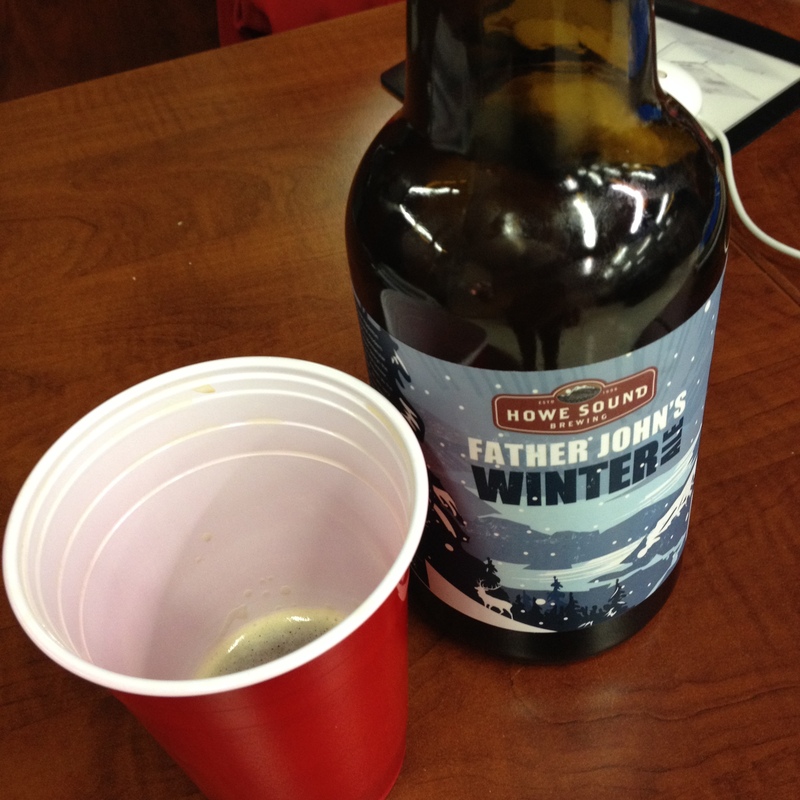 Maybe a hint of citrus, or a bit of vanilla, as you see in other winter beers. Instead, it’s much of the same all the way through. Whole lot of the same. Add in the higher ABV, and I found a glass of this (OK, half a solo cup) to be as much as I could take. I followed it up with a different beer that, while not great, was just slightly lighter and slightly more varied and breathed a sigh of relief. Posted in Beer. Tagged Howe Sound Brewing Co., winter beer. Your label is quite charming! Posted in Cider. 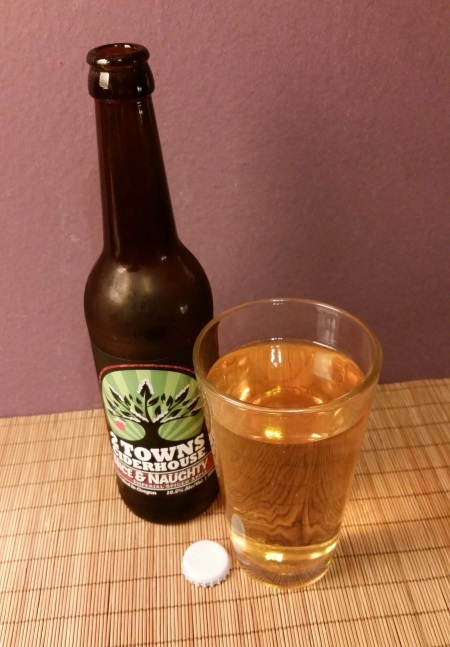 Tagged 2 towns ciderhouse, 500mL, nice & naughty. Thanks to Bad Rider friend and KTW reporter Jess W. for the awesome layout, and using a picture of me where I wasn’t making an awful face. 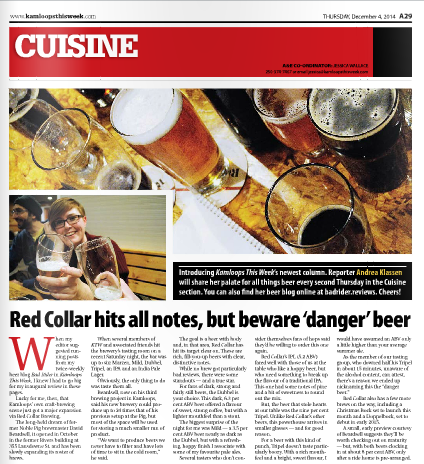 Red Collar‘s concept is a little different, and relatively new for B.C. The brewery has a liquor licence that only allows it to serve its own product — so don’t bring your friend who only wants gin and tonics here. Food options vary quite a lot. While they partner with local food trucks some nights, on others you’ll only have pepperoni sticks and the like to soak up the alcohol. As to the brewery’s tasting room, it’s definitely bare bones — pretty much a concrete box with tables. There’s no music, no televisions, and not much in the way of sound dampening. The one thing I’ve noticed on a few RC visits is you may find yourself shouting a bit, because voices tend to echo in the room. Brewmaster David Beardsell said he’s mostly interested in beer, not “nightclubbing” and sees the Spartan nature of the place as a feature not a bug. A lot of these beers are sweeter than I’d normally like, but I think the clarity of the flavour balances the added sugar in some cases. 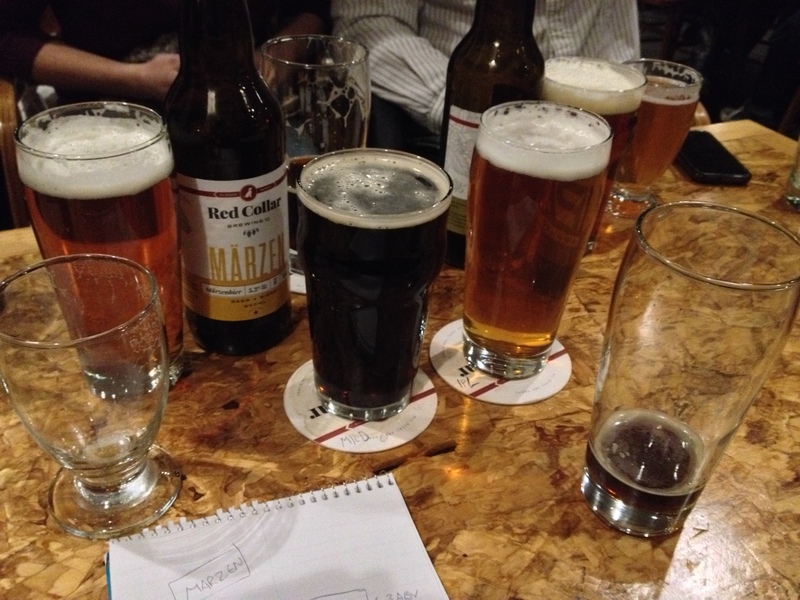 The Dubbel, Tripel and Marzen were definitely sweet. Mild, IPA and IPL much less so. As I mentioned at the bottom of the review, Beardsell ended up offering us a quick tour of the brewery at the end of the evening (though we didn’t alert staff we were reviewing the brewery at any point earlier in the night). The Doppelbock we sampled was a hit for most of the crowd, and our tastes in beer vary wildly. It’s dark, very smooth, and very powerful. I’m looking forward to trying it in early 2015, preferably when not I’m not half cut already. Posted in Beer. Tagged Kamloops, Red Collar Brewing, Very Special Features. As some of you may have noticed, my newspaper co-workers make fairly frequent cameos in the reviews for this blog. After all, who’s better qualified to give an opinion on alcohol, really, than a bunch of journalists? I’m excited to announce that equation now goes both ways. Starting this Thursday, the beer section of Bad Rider Reviews will appear periodically in the pages of Kamloops This Week. While this won’t normally disrupt our blogging schedule, my first outing for KTW is so ridiculous and massive I’m going to let the paper have the glory (and not just because they paid for a portion of the beer up for review). Check back here on Dec. 4 for a link to the finished product and some too-tipsy-for-primetime thoughts cut from the final review.